All current Royal Crown Derby available. Watch out for our Royal Crown Derby demonstration events. Details will be posted when available. 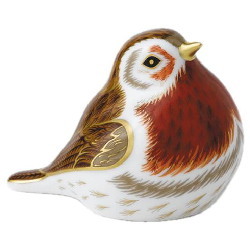 Please note that all Royal Crown Derby items are made in their factory in Derby, Derbyshire, England. no items are made overseas. All paperweights are first quality complete with their gold stopper. Any Royal Crown Derby current production item not shown on our web site can be ordered for you. Please telephone or email for details of prices and delivery times. 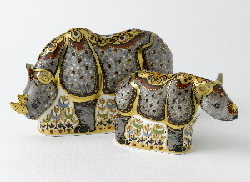 In 1745 André Planché, a Huguenot an immigrant from Saxony , settled in Derby, where between 1747 and 1755 he made soft-paste porcelain vases and figurines. At the beginning of 1756 he formed a business partnership with William Duesbury (1725 - 1786), a porcelain painter formerly at Chelsea porcelain factory and Longton Hall, and the banker John Heath. This was the foundation of the Derby company. Planché disappeared from the scene almost at once, and the business was developed by Duesbury and Heath, and later Duesbury alone. A talented entrepreneur, Duesbury developed a new paste which contained glass frit,soaprock and calcined bone. This enabled the factory to begin producing high-quality tableware. He quickly established Derby as a leading manufacturer of dinner services and figurines by employing the best talents available for modelling and painting. In 1770, Duesbury further increased the already high reputation of Derby by his acquisition of the famous Chelsea porcelain factory in London. He operated it on its original site until 1784 (the products of this period are known as " Chelsea-Derby "), when he demolished the buildings and transferred the assets, including the stock, patterns and moulds, and many of the workmen, to Derby. Again, in 1776, he acquired the remainder of the formerly prestigious Bow porcelain factory, of which he also transferred the portable elements to Derby. In 1773, Duesbury's hard work was rewarded by King George III, who after visiting the Derby works granted him permission to incorporate the royal crown into the Derby backstamp, after which the company was known as Crown Derby. In 1786, William Duesbury died, leaving the company to his son, William Duesbury II, also a talented director, who besides keeping the reputation of the company at its height, developed a number of new glazes and body types. William Duesbury II did not live to fulfil his promise: he died in 1797 at the age of 34 and the company was taken over by his business partner, an Irishman named Michael Kean, who later married Duesbury's widow. William Duesbury III, born in 1790, son of William Duesbury II, took over the factory when he came of age in 1791, and Kean having sold his interest to his father-in-law, William Duesbury's grandfather, named Sheffield, the concern continued under the name of Duesbury & Sheffield. In 1815, the factory was leased to the firm's salesman and clerk, Robert Bloor, and the Duesburys played no further part in it. Bloor borrowed heavily to be able to make the payments demanded but proved himself to be a highly able businessman in his ways of recouping losses and putting the business back on a sound financial footing. A group of former employees set up a factory in King Street in Derby, and continued to use the moulds, patterns and trademarks of the former business, although not the name, so keeping alive the Derby traditions of fine craftsmanship. No mechanical processes were used, and no two pieces produced were exactly the same. In 1877, an impressive new factory was built by new owners of the Crown Derby name in Osmaston Road, Derby, thus beginning the modern period of Derby porcelain. In 1890, Queen Victoria appointed Crown Derby to be "Manufacturers of porcelain to Her Majesty" and by Royal Warrant granted them the title "The Royal Crown Derby Porcelain Company". 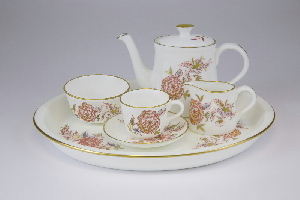 In 1935 Royal Crown Derby acquired the King Street factory, thus reuniting the two strands of the business. In 2000, Hugh Gibson, a former director of Royal Doulton and a member of the Pearson family, led a buy-out, making Royal Crown Derby once again an independent and privately-owned concern.